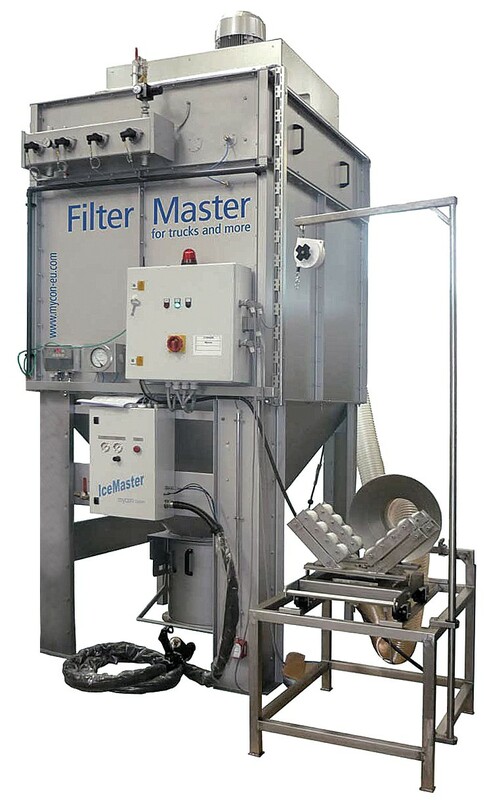 Kipp Umwelttechnik cleans particulate filter in the cooperative association FilterMaster DPF. The quality and efficiency of the FilterMaster cleaning method for cars is impressive. Since no cutting and welding work is required, the entire housing including the pipes remains intact. Previous cleaning methods applied for car diesel particle filters (DPF) have significant disadvantages resulting from the cutting, subsequent welding of the detached parts and sanding work. Also no costs are generated for the cutting, welding and sanding work. The method also differs significantly from other cleaning methods that clean particle filters by rinsing with water and/or with water-based or other chemicals. Water can penetrate the porous “washcoat” – which binds the catalytic metal particles. 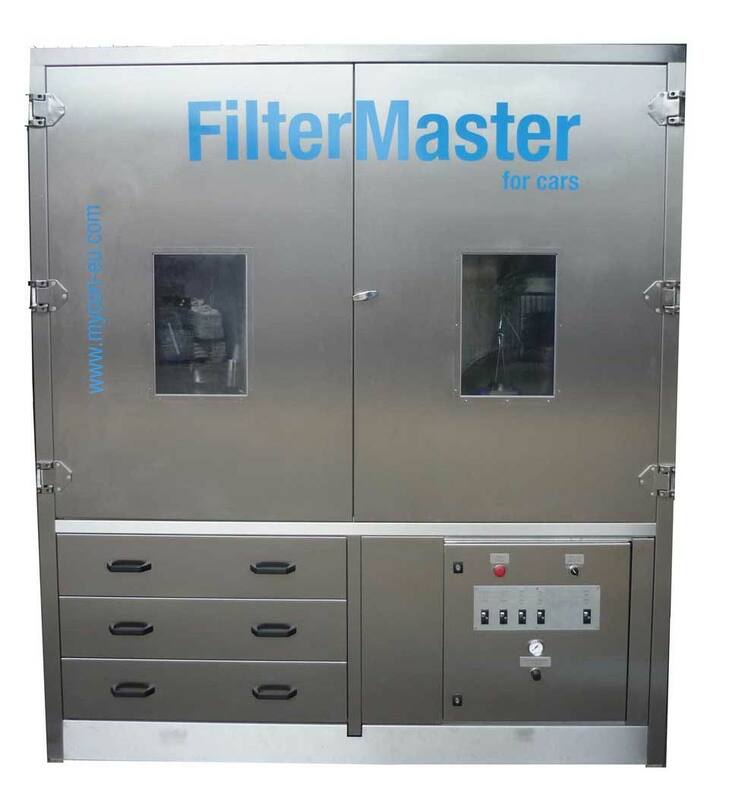 In contrast “FilterMaster for cars” operates with purified compressed air to which a microscopic amount of active agent is added as an aerosol for just a short while. The active agent is non-toxic and could even be potable, except for its unpleasant taste. Research and practical experience have shown that the active agent will not damage the catalytic surfaces. The fact that the process does not damage exhaust particulate filters has been confirmed by several studies, including one at the University of Paderborn. No damage by the entry of “drinkable chemistry” was showed through the procedure test. The story began in 2011 as part of a two-year grant project involving Kipp Umwelttechnik and the University of Paderborn. The project sought to develop a method for purifying exhaust gas particulate filters without having to dismantle or separate the supply and discharge lines to the filter. This project laid the foundations for the subsequent successful joint development “FilterMaster for cars”. This regeneration system constitutes a whole new design in comparison to the previous concepts in the DPF regeneration palette. In terms of cleaning speed and cleaning success the mycon system is a quantum leap ahead of previous conventional processes. A variety of different special jet nozzles are used together with certain carbon dioxide/compressed air mixtures with additives as well as some additional industrial gases for the regeneration of metal and ceramic filter surfaces. The entire filter surface is worn down in a controlled manner depending on the filter type and over 90% is cleansed of the original soot volume. The process can be precisely controlled as every type of filter and processing can be accurately repeated. The system works in a closed-loop circuit. Adaptive flange rings enable the accommodation of almost every filter type and square filters of an older style can also be regenerated. There is a fully automatic system available for series regeneration in collection stations for vehicles, communal support points, large construction sites or other areas where regular filter cleaning is required. A manual device is available for smaller volumes. As with all mycon devices the new cleaning station is also available to lease without any investment costs, incl. the complete gas technology and gas delivery. The filter test system belonging to mycon GmbH. 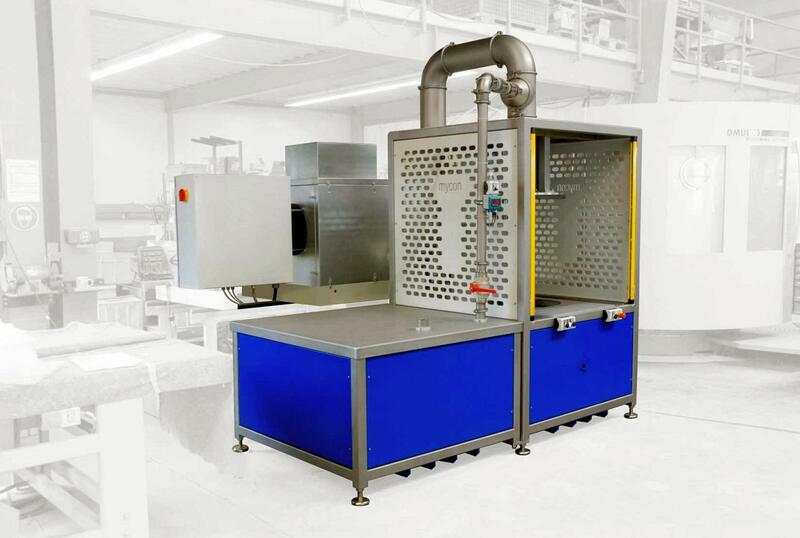 The filter test system serves to measure the through-flow-behaviour of soot particle filters before and after cleaning. The filter testing facility is suitable for holding diesel particle filters weighing up to approx. 500kg, at a length of 200-700mm with a diameter of 200-700mm.